CERN is not the only lab to be holding a seminar. Today at 09:00 CDT Fermilab will be announcing the latest results from CDF and D0. Rumors suggest a 3 sigma excess (technically an “observation”) in the interesting region. So if you can spare the time I’d recommend you listen in on the announcement. You can see the webcast information here. For those of us who can’t get enough of the Higgs boson and want to brush up on the basics I would recommend the following show, put out by the BBC. 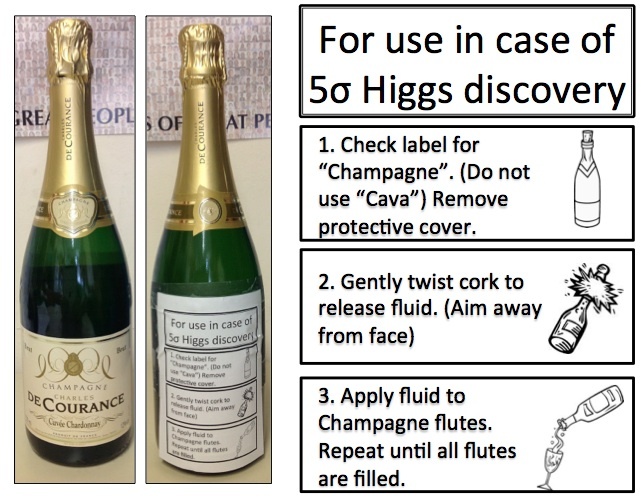 This contains the latest results from the 2011 searches and it goes into quite a bit of depth about why we think the Higgs boson exists and what to expect from the 2012 searches. Finally for those keeping score I still have $20 riding on a non-discovery. If a 5 sigma excess is seen on Wednesday there is a bit more work that needs to be done to show that it is the Standard Model Higgs, and that would probably take until the end of 2012 running. So my $20 is safe… for now.